The Lady Caroline Swarovski tiara from Aristocrat Tiaras features a 10mm heart crystal bead suspended inside a heart shape. 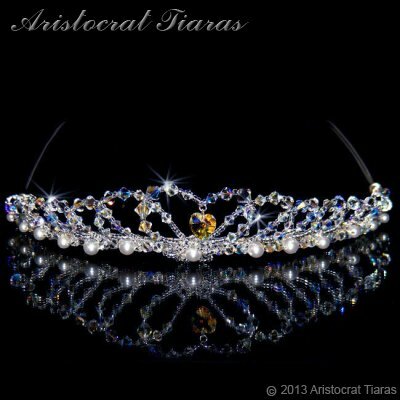 There are crystal arches on either side of the tiara with crystal AB and white pearl beads along its visible length to create a sparkling effect. This is a stunning and stylish crystal bridal tiara will certainly keep you in the spotlight on your wedding day or any special occasion. Duchess Elizabeth necklace or Princess Esme earrings from our wedding jewellery collection are designed to compliment this crystal tiara.